Personality: Cloud is generally very quiet but due to his disturbed past he can be very dark and depressed in the eyes of many. He can also be stuborn in some odd situations. Nothing in life comes before his friends. Cloud also cherishes everything good about the world. Standard Attack: Buster Sword. Cloud slashes anything with his signature weapon, the Buster Sword. 2nd Skill, Ability, and/or Weapon: Thunder. Cloud shoots a bolt of thunder from the sky at an enemy. 70 damage. 80SP. 3rd Skill, Ability, and/or Weapon: Blade Beam. Cloud shoots a beam out of his sword which hits all enemies. 40 damage. 60SP. History with your Amigo: Despite all of Clouds efforts and attempts he just can't make it into SOLDIER and reluctantly becomes a regular Shinra Guard. While on duty he meets first-class SOLDIER Zack Fair and the two of them become great friends. Cloud later decides to join Zack and Sephiroth when they are investigating a damage reactor in Mt. Nibel. Tifa, Clouds childhood friend, is to be their guide and Cloud being ashamed of being rejected by SOLDIER hides his identity from her. When they reach the reactor Sephiroth finds Professor Hojo's failed experiments with Mako soldiers. He also finds Jenova which Sephiroth thinks is his mother. Eventually, Sephiroth basically goes mad concealing himself alone while reading the works of Professor Gast. He comes out of the village and practically goes crazy destroying everything in his path. Cloud wittnesses his mothers death and runs to the reactor to confront Sephiroth. There he finds an uncontious Tifa and Zack struggling onto life after his battle with Sephiroth. 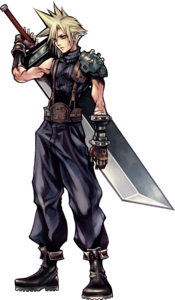 Cloud grabs Zacks Buster Sword and catchs Sephiroth off-guard as he slashes him severly wounding him. He then runs back to comfert Tifa, and a little while in a conversation Sephiroth comes out and stabs Cloud. Cloud gains a sudden burst of strength and uses Sephiroths sword a way of throwing him into the mako stream below, Cloud passes out right after this. Cloud and Zack become test subjects of Professor Hojo for four years, being injected with Sephiroths cells. Zack escapes and frees Cloud. The two of them escape and Zack gives Cloud a SOLDIER uniform. While escaping Zack can't stop talking about his plans for him and Cloud and what his past used to be like. Before they make it to Midgar hundreds of Shinra Soldiers come to stop them. Zack fights alone to protect himself and to protect the still vegitated Cloud. He defeats all but a few in an amazing show of strength and courage but his gunned down by the remaining few. Before Zack dies he gives Cloud the Buster Sword and says his Spirit will always live on in him. Before Cloud leaves for Midgar his last words to Zack are, "Good-night, Zack" Cloud then basically thinks he is Zack due to the injections and the trama he went through and believed that Zack never existed. He says he is a former SOLDIER first-class and since the experiments were like that of a SOLDIER first-class's training, he is accepted as one. Location : Somew- wait, why do you want to know? !